.....but not for the crime of the century he helped to orchestrate. 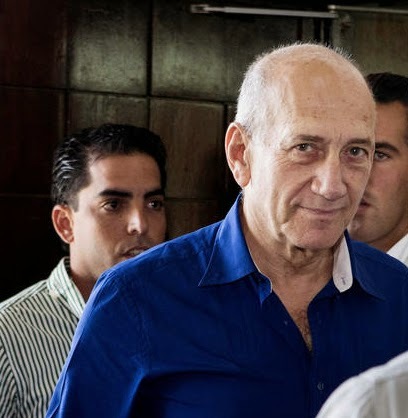 Ehud Olmert, the right-wing Likud politician, was in New York on September 10, 2001, the day before 9-11, meeting with supporters of the Israeli terrorist gang of the Irgun (Betar). Olmert was in New York City on the very eve of 9-11 but has concealed this secret visit. Why? What is most odd about Olmert's meeting in New York is that it was not reported at all and that Prime Minister Olmert has done everything to conceal the fact that he was in New York on the day before 9-11. Why would Ehud Olmert, the Irgunist mayor of occupied Jerusalem, seek to conceal the fact that he was in New York on September 10, 2001? And why would Rudy Giuliani, the mayor of New York, conspire to conceal Olmert's presence in New York on September 10 and 11, 2001? Did the right-wing mayor of Jerusalem and close associate with the murderous Yitzhak Shamir stay in New York that night? Did he have a "front-row" seat for the Zionist terror spectacle that occurred the next day? 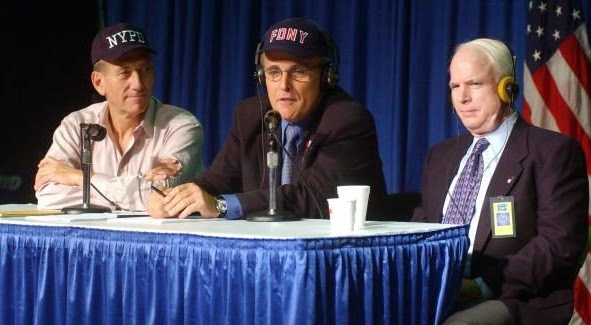 Ehud Olmert, the extreme right-wing mayor of occupied Jerusalem, with Rudy Giuliani, the mayor of New York City and Sen. John McCain (R.-Arizona) at the Emergency Operations Center in New York on September 21, 2001. Ehud Olmert, the right-wing Likud politician who is currently prime minister of Israel, was in New York on September 10, 2001, the day before 9-11, meeting with supporters of the Israeli terrorist gang of the Irgun (Betar). Olmert was in New York City on the very eve of 9-11 but has concealed this secret visit. Why? Did the right-wing mayor of Jerusalem and close associate with the murderous Yitzhak Shamir stay in New York that night? Did he have a "front-row" seat for the Zionist terror spectacle that occurred the next day? The evidence strongly suggests that he did. Kenny, just so's you know...the Bollyn link doesn't work. Coinkydynk? I think not. Thanks, fixed it for now. "Make no mistake about it"
Kenny, I am working on an article about the official grand opening of the 9/11 National Museum, scheduled for next week. The museum seems dedicated to upholding the official 9/11 narrative (naturally), and the opening day, May 21, will likely get a lot of media fanfare. Along with the article I plan to also post "The REAL 9/11 Museum," which will basically be a collection of videos pointing to Israeli involvement in 9/11. So I would like to extend an invitation to you and your readers to share links to any videos you think could use wider exposure. Richard Edmondson....here is my blog entry regarding 9/11 to share with your readers. It has some links attached. gc, It appears I can't access your link. Richard, A basic one and widely seen, Carl Cameron's Fox News report on the Israeli spy ring and its connections to 9-11. The "9/11 - Missing Links" (search the title at youtube) video has a lot of information but one of the producers is a very dubious character so I'm hesitant to promote it. "Prison" in yidspeak means "beach with hooters". aka KennyLayland, where somebody madoff with the loot. Kenny, thanks for the Cameron videos, they'll definitely be in the mix. Greencrow, nice blog, I'll put up a link to it, but I couldn't access the 9/11 entry either. I look forward to your article Richard. The whole thing is ridiculous. The architect is Israeli. 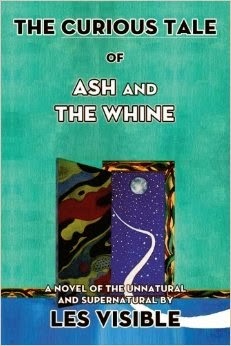 That's laughing at us. Looking at some photos and videos of what's going to be included in the memorial, I think that some of the relics that have been stored are not going to be included. They might make some folks think about the energy required to demolish the towers. A group of American business and political leaders are building a pro-TALMUDIA media "war room" in Washington, D.C. The group will be called "Emet"—which in Hebrew means "truth." both of whom are trying to build and/or acquire weapons of mass destruction....freaking oooga booga !! Funding Emet is Leonard Abramson; he sold U.S. Healthcare to Aetna in the mid-1990s for $8.9 billion. and Lou Ranieri, a major Wall Street player who now co-owns one of TALMUDIA's largest banks. Also joining the board are Jeane Kirkpatrick, former ZOG U.S. Ambassador to the UN, and Jack Kemp.